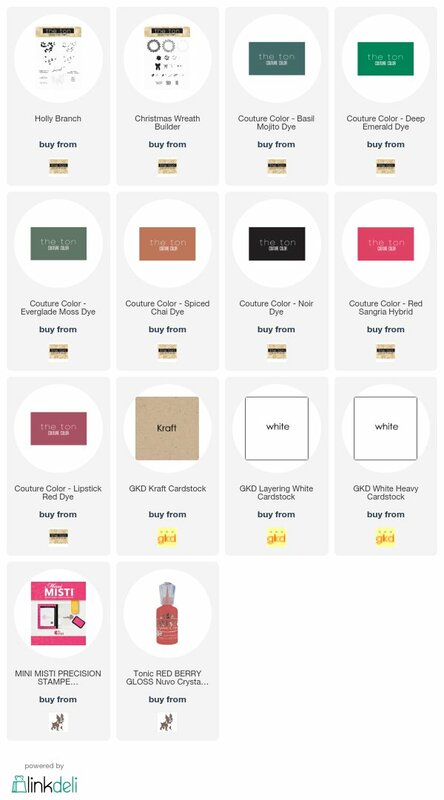 Justine's Cardmaking: The Ton Fall Release Blog Hop! 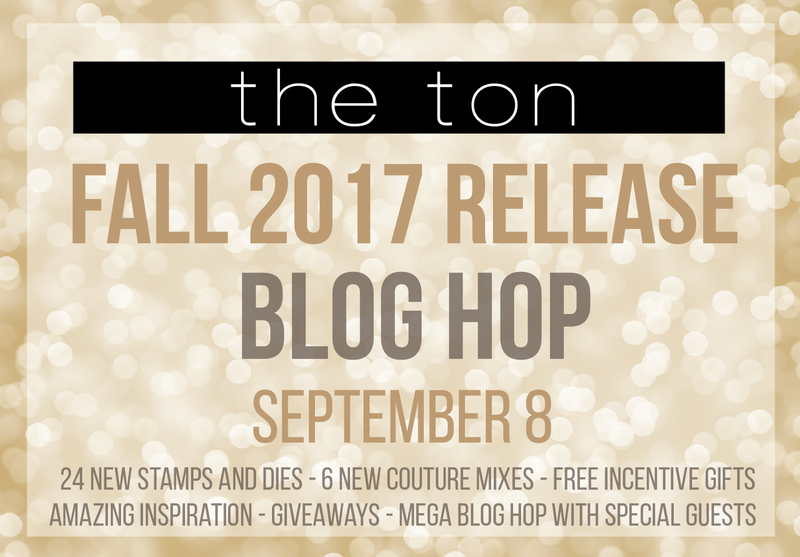 The Ton Fall Release Blog Hop! it's such an exciting day! The new release for The Ton is now available! 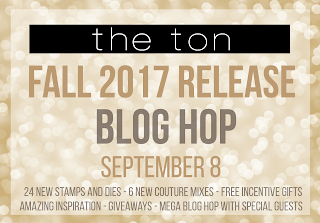 The Ton has 24 new stamps, coordinating dies and 6 Couture Mixes for their new Fall 2017 Release which includes up to three free gifts with purchases. For more information on The Ton’s incentive gifts, head over to The Ton’s blog. All new release products are available now! 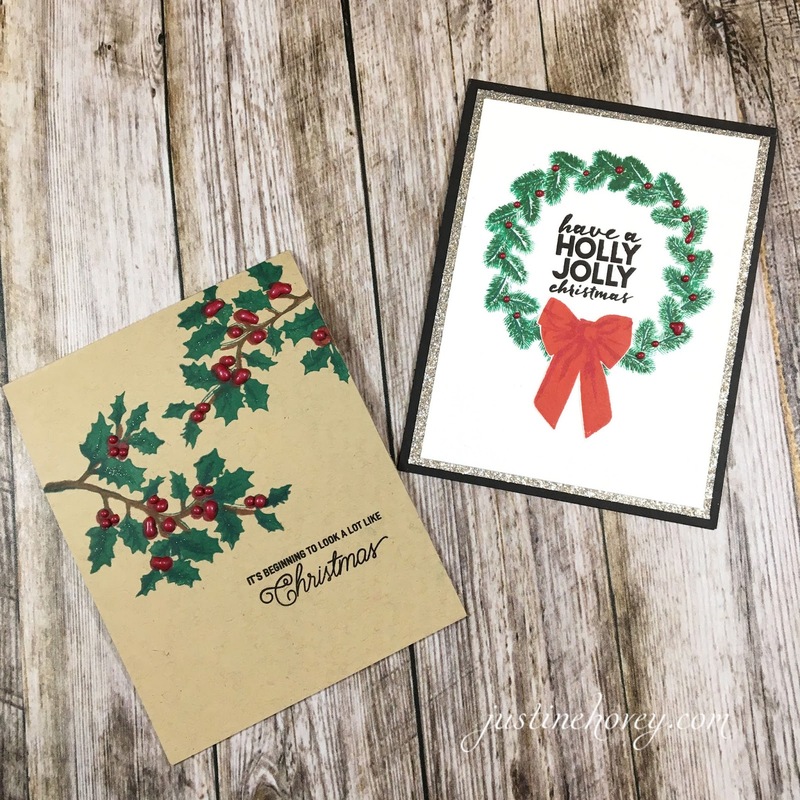 I have to say this Christmas Wreath Builder is one of my favourite stamp sets of all time! As I mentioned in the video, I preferred the card without the Nuvo drops once I was finished, however both give off a really great effect in the end. If I were to do it again, I would add one set of drops, let them dry and add the ones beside it to avoid them blending into each other. GIVEAWAY!!! Three new release stamps will be given away to random commenters from the hop participant blogs. To qualify, you must leave a comment on The Ton Blog Hop post. The comment period will close on Monday, September 11th at 11:59pm. Winners will be announced thereafter on The Ton’s blog. The Christmas Wreath builder is really amazing for those who enjoy that detailed elegance on cards! They stamps are just so gorgeous and easy to line up. The details on the holly are truly stunning! Go through the Hop for more inspiration!!! Beautiful cards. This release is gorgeous. Great cards, love the wreath one best! I love the wreath builder stamps! Such a great stamp set to have in the collection. You make me want to buy the Nuvo drops asap! Just went I thought I did not need another stamp set, You showed mw I do indeed neeed this set. Both cards are lovely. I love the holly. Hi Justine, both cards are lovely, TFS! Wow!! Both cards are gorgeous!! I love the Nuvo drops on them both. Love the colors on Kraft. Love your cards!! Thanks for the video showing your process and techniques! Nice Card Design, the Holy was one of my favorite from this release thanks for doing a video using it helps to see it in action. Hope you get your room back in order! beautiful creations, I love the holly on kraft. I love the fonts that were used in the sentiments! Your cards are just gorgeous!!! Pretty cards. Thanks for sharing. I can't paint, so I like layered stamps. 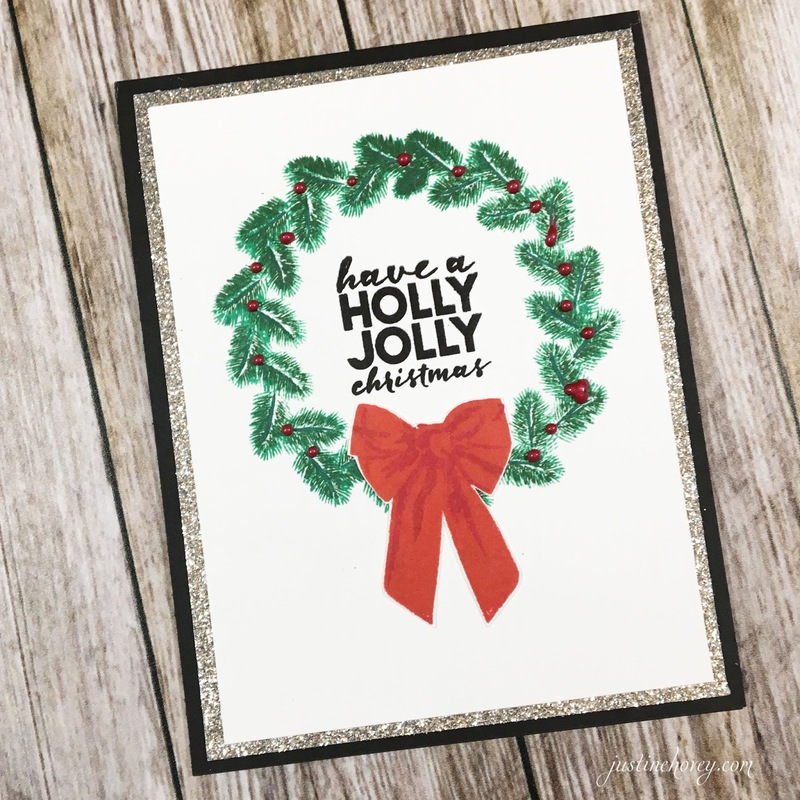 Love the build a wreath and the holly card is beautiful. The pine branches look so real. I always love a wreath. Thanks for the tip on applying Nuvo drops. Holly Branch is on my wish list. Fantastic cards, the Holly Branch is one of my favorite sets. Great cards! Thanks for sharing your talent. Beautiful wreath card, looks just like the one I hang on my front door. Really cute card and better before the drops, yes. Love the holly and the greens! My favorite is the wreath card. That wreath builder set is really wonderful. I love the holly but the detail in the wreath is just amazing. Thank you for sharing. Lovely cards. I especially like the holly on craft. I really like your holly card. I think all the designs with that set have been something I would like to try. Great cards. Especially love the red and green on the kraft. Your cards are gorgeous. I love those traditional colors especially on Kraft. I think the Nuvo drops are great but I understand about letting the first ones dry. Both of your cards are great but the one on the kraft base looks like the berries are real !! LOVE the wreath, LOVE the holly branches, such ELEGANT designs! I love your cards. Thanks for sharing the video. Lovely cards! 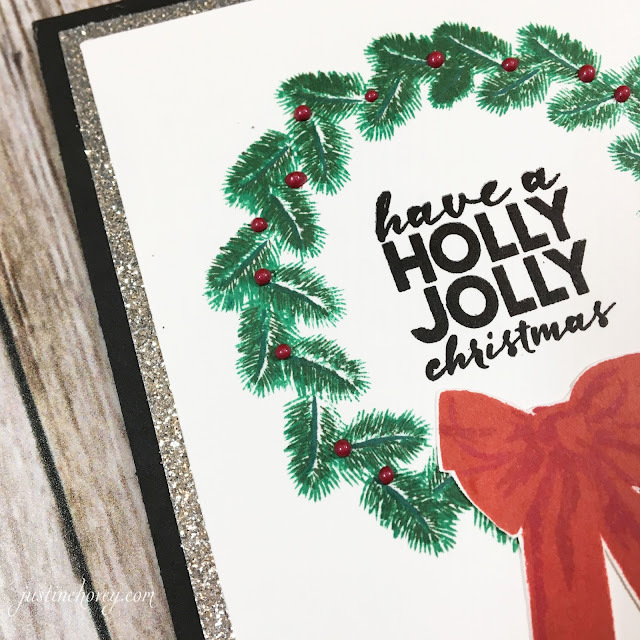 I like the pairing of the silver and black on the holly jolly card. Thanks! So beautiful! Love these new sets! I love holly and berries at Christmas time they are just beautiful and you did a beautiful job! Another great release from The Ton. They always have such cute ideas for products. I love that holly sprig. Your cards are so pretty! Your cards are beautiful. I'm not a fan of layering stamps, I find them quite difficult to use. But, these are so beautiful, I'm tempted to try them one more time. Lovely designs Justine! Thanks for the inspiration! Have a wonderful day! Oooo... red & green on Kraft look so cool! Very pretty for the holidays. I like both of your cards for Christmas! I think the Nuvo drops add a lot, even if they did happen to blend together. Love the wreath and the holly! Beautiful cards! Love you cards! The wreath and holly are fantastic. Really lovely cards. Thanks so much for sharing! Love, love, love your cards! Saw your video and had to have the stamp sets ❤️. Beautiful CAS cards. Love them. Great cards, love the greenery and the gold? cardstock on the holly card, looks great! 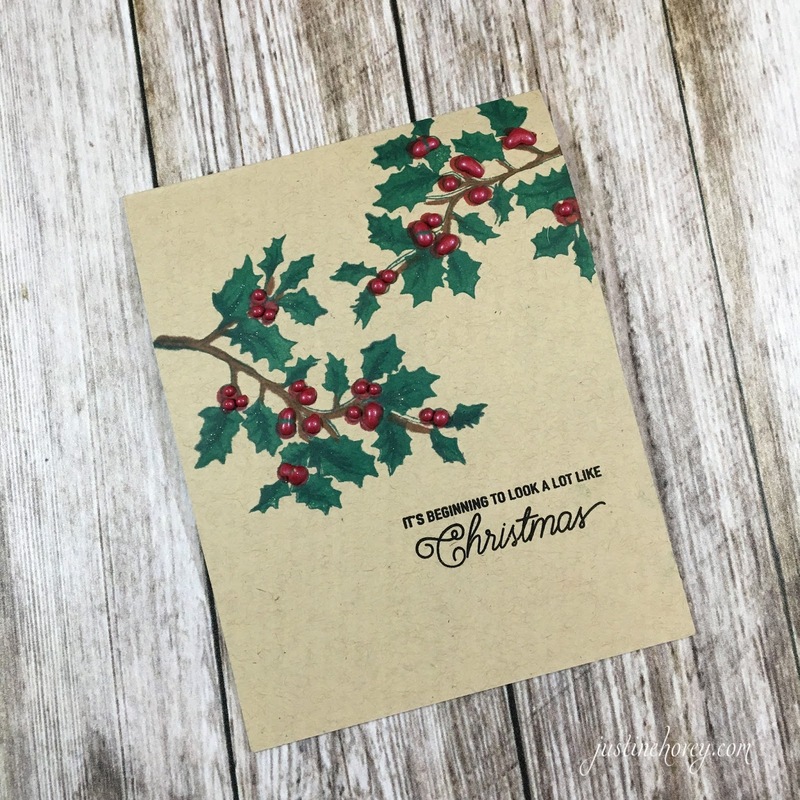 Really loving the holly and berries so festive thanks for the inspiration always a pleasure Justine!